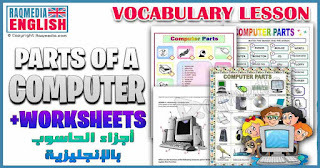 Learn English words for computer software, hardware and accessories. مصطلحات الكمبيوتر باللغة الإنكليزية و مرادفاتها باللغة العربية. مصطلحات الكمبيوتر والانترنت انجليزي عربي هو درسنا لهذا اليوم. ونظرا لتطور الحاسب الآلي وأهمية أجهزة الكمبيوتر في حياتنا وتطور التكنولوجيا. As we all know, computers have become a part of daily routine and obviously an essential tool that governs several activities and life tasks. For all these reasons, it is surely a must for those planning to acquire a new language to care about such vocabulary items. Knowing computer-related vocabulary will help you speak English confidently while you are having a conversation. This vocabulary lesson will be more important to those who are learning English for business or academic purposes - also known as EPS which stands for English for Specific Purposes. You can learn some examples through our interactive course in the video below. Here you can listen, repeat and simply practice some of the most common ESL / EFL expressions and phrases used to name parts of the computer. Download free crosswords, puzzles, worksheets and flashcards about the most common ESL / EFL expressions and phrases used to talk about parts of the computer for beginners from the links below. This vocabulary lesson is targeted to the beginners and intermediate to build their basic vocabulary in English and help them speak confidently. You can review the expressions to talk about your family in English in our lesson here. Now! You are able to talk about the parts of the computer in English. Congratulations! 👏 And keep practicing for better mastery. Thanks for your attention. Hope you liked the lesson and see you again in an other English lesson in our coming courses. Don't forget to subscribe to our newsletters to receive new tips right to you inbox.